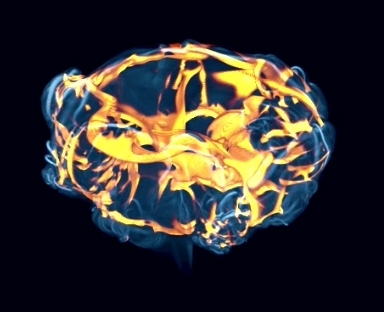 Flame ignition in type Ia supernovae (SNe Ia) leads to isolated bubbles of burning buoyant fluid. As a bubble rises due to gravity, it becomes deformed by shear instabilities and transitions to turbulent evolution. Morton, Taylor and Turner (1956) introduced the entrainment assumption for inert thermals. In the present paper, we use the entrainment assumption, suitably modified to account for burning, to predict the late-time asymptotic behavior of thermals in SNe Ia, and compare with three-dimensional simulations. 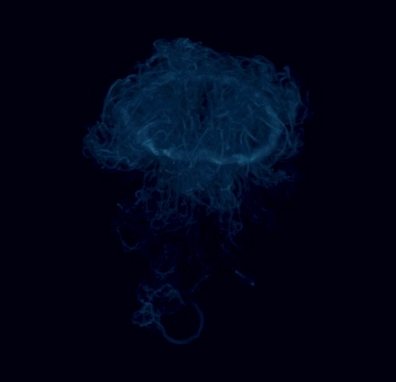 Here we present two simulations of buoyant bubbles in conditions similar to that of a type Ia supernova. One of the simulations is burning carbon to magnesium, and the other is an inert control for comparison with the original theory of Morton, Taylor and Turner (1956). The simulations were initialized with a large bubble of buoyant fluid, which was set to be magnesium in the burning case. A large perturbation was added to flame surface to trigger the shear instabilities in an asymmetric manner. 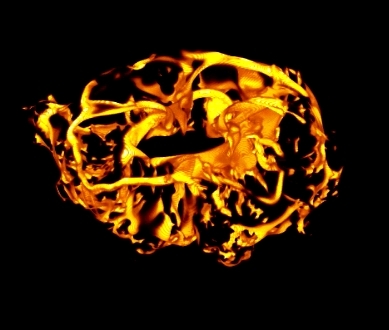 The image on the right is a three-dimensional rendering of a snapshot of the burning case. The burning rate is shown in orange, and the vorticity is shown in blue. Click the image to animate. If you have trouble with the animation, right click and save the movie. 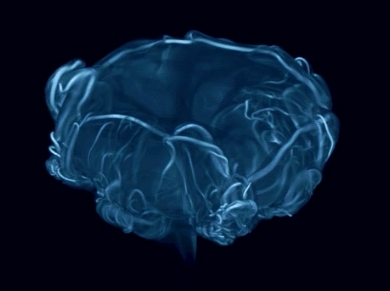 This is the same image and movie as above, but just showing the vorticity field. This is the same image and movie as above, but just showing the burning rate. This is a three-dimensional rendering of the vorticity field in the inert case. This image shows two-dimensional slices of vorticity through the inert thermal at various times during the evolution. Any questions should be directed to Andy Aspden.